Everyone had been silently praying for a wayward comet to come hurtling through the roof of committee room 1 and thus bring to a merciful end the interminable tedium, when all of a sudden, Marc MacSharry provided some delightful comic relief. The Taoiseach was before the Banking Inquiry and seized the opportunity to throw handfuls of the brown stuff at the last Fianna Fáil/Green government. "By 2007 you had an uncompetitive, bloated, over-borrowed and distorted Irish economy that had been left at the mercy of subsequent international events," he declared. But it was all quite humdrum until the Fianna Fáil senator got his turn at the questions. Bristling with belligerence, Marc barked at Enda that he wanted one-word replies to his questions. "Just Yes or No, Taoiseach," he ordered, rapping out his first question. "Yes," said Enda in reply. Marc paused. "Could you give examples of that?" he asked, as quiet sniggers rose in the room. Then Marc went off on his mission du jour, which was to uncover any dodgy links between Fine Gael and Labour high-ups and dastardly developers. "Can you inform the committee if you have ever accepted hospitality from a developer in the form of transport by road or air?" he all-but shouted. A bewildered Taoiseach did a double-take to ascertain he wasn't messing. "What do you mean by road? You mean getting a lift from somebody?" he ventured. "I've travelled so many places by road and air over the years. Tell me what you're taking about." It wasn't entirely clear if Marc himself knew either. "No. I'm merely asking the question. Have you ever? So it's a Yes or No, I think," he retorted. Oh he got in a right tizzy. He was Jack Nicholson roaring about the Truth, all pop-eyed self-righteousness. "Have you ever accepted any hospitality from a developer by way, as you put it yourself, a lift in a car, a flight on a plane, a lift on a private jet or so on, Yes or No? A helicopter? Yes or No?" Marc thundered. Did he actually know something? Had he fuzzy photos of Enda quaffing bubbly on a Gulfstream jet with someone Big in the building world? It quickly became clear he had no such thing. Enda eventually gave up. "I've never sought hospitality or transport from a developer," he stated very firmly as Marc's bizarre haranguing continued. "It's a ridiculous question," he added. But it didn't knock a feather out of Marc. The wound-up senator was taking skelps at everyone. His famous daddy, former finance minister Ray MacSharry was known as Mac the Knife, but alas, he's more akin to Mac the Mallet. He was even rude about the Tánaiste, snapping at one witness that 'Time is very short, and we don't want to do the Tánaiste on it'. To be fair, Joan Burton during her evidence in the afternoon session had driven everyone mad with her Joycean, punctuation-free, endless answers. Even the mild-mannered Michael McGrath lost his cool and tossed the toys out of his cot after one endless soliloquy. "I'm utterly frustrated, I'm sick of it," he moaned fretfully to chairman Ciaran Lynch. But then Mac the Mallet came up against Pat Rabbitte, and flung the same helicopter/largesse question at the former Labour Party leader. An unimpressed Pat eyed his prey, but took the scenic route before sinking his fangs into Marc's neck. 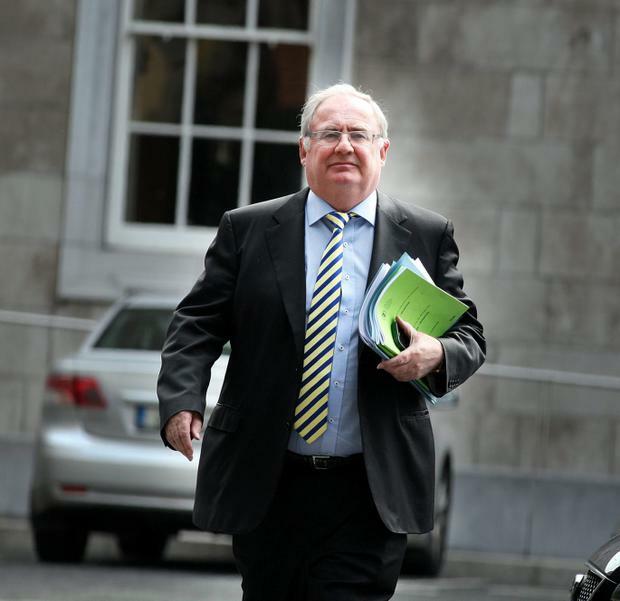 The Dublin South-West TD wasn't minded to get kicked around the Banking Inquiry, given that he's not running for election again and therefore is almost out the gap. He had signalled his intent at the very start, when Marc tried to butter him up by describing him as having "a reputation of someone who calls it as he sees it", only for Mayoman Pat to respond to the Sligo Rambo: "Well, I certainly called the Connacht final." That was a low blow. But Pat was only warming up. "The hospitality issue is an issue of transport, is it? I mean - if I got a pint at some stage from a developer, is that included in the rubric of your question?" he deadpanned. Then he seemed to relent. He told his inquisito he had travelled to matches with a pal of his, a small builder. "To be truthful, I don't know how good he is at it, his father was the small builder," said Pat chattily, before his fangs swiftly descended. "And I notice sometimes, senator, that talent skips a generation." "Oooh!" guffawed the entire room. Marc grinned along with them, until the barb eventually hit home. His smile vanished. "That's a good one," he conceded through gritted teeth. At least the comedy routine kept everyone awake.